I'll also point you to this thread, VM have been doing a lot of work, they've had to! My cable broadband will be disconnected on Monday because service isn't very reliable and suffer loss of service. Cancelled it with my 14 days cooling off. Going to stay with FTTC with Plusnet as the cease order has been successful removed. Dare I ask what happened with VM when you say unreliable? Ha ha .... apologies Ronski, I'm extremely busy these days and my memory is poor at the best of times. Service become loss of broadband downtime for 12 hours. So, I was thinking back in 2014 when Virgin Media is very bad in my area with congestion and loss of service problem haven't improved at all. 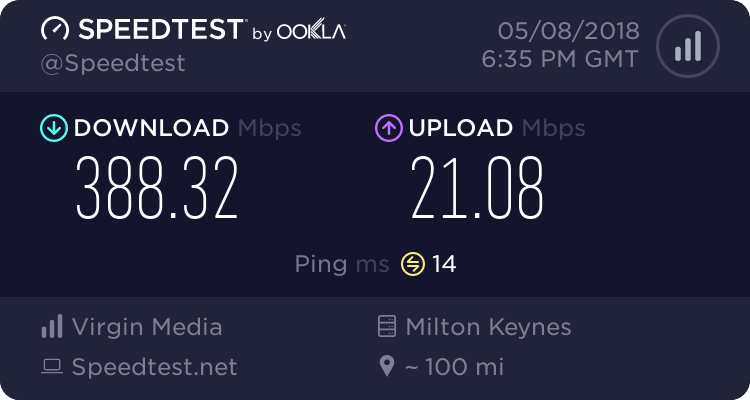 So, I am staying with FTTC, mind you, I have to accepted 74Meg banded by DLM doesn't bother me anymore cos I just enjoy watching Netflix , Sky Go online and xbox etc. Help me to keep my mind off. Got noticed from BTw to alert me there is multiple orders open on my line which it due to be complete by 19th dec 2017. And cease on the broadband pending to be completed by 19th dec 2017. Any thoughts out there on the name of the exchange max is on? I know it is Cuckoo Oak, WNCKO. Me to, 13 hours working on the house yesterday, it WILL be done before Christmas. Carpets being fitted this afternoon, then just some relatively simple things to finish off. You say that. But it is a constant source of irritation to know that something has been artificially limited for no real reason. I know, like how I moved to Plusnet and now only seem to be able to hit 60Mb when I was previously getting 75Mb with Zen you mean? I was banded at 74 meg for months (it was triggered by me testing/trialing a Draytek Vigor 130) and it only got removed when I moved from BT to Plusnet 18 months back. It has been syncing at a solid 79999/19999 ever since. I am expecting mine to be banded at 74Meg until next summer 2018 when G. Fast become avaliable for cuckoo oak then I am sure that banded will be removed off by G fast. Will upgraded to 330/50 G. Fast depends my line length to the street cabinet at approx 250m away. Max are you doing loads of speed tests and using up all the bandwidth? @Kitz how did you specify an area when looking up virgin media? I'm trying to scout out my area. Nice. Are the G.Fast rollout plans published anywhere? I don't see any work being carried out in my area so typically, we'll be among the last to get anything new.